Ambassador of Myanmar to Cambodia H.E. U Cho Htun Aung paid a farewell visit to Cambodian Prime Minister Samdech Akka Moha Sena Padei Techo Hun Sen this morning at the Peace Palace, Phnom Penh. On the occasion, H.E. U Cho Htun Aung said it was a great honor for him to fulfill his diplomatic mission in Cambodia whose religion, custom, and tradition are quite similar to Myanmar, H.E. Eang Sophalleth, Assistant to the Cambodian premier, told reporters after the meeting. H.E. U Cho Htun Aung also expressed his gratitude to the Royal Government of Cambodia for its support to Myanmar, especially in its national election, as well as to his diplomatic mission in the Kingdom. 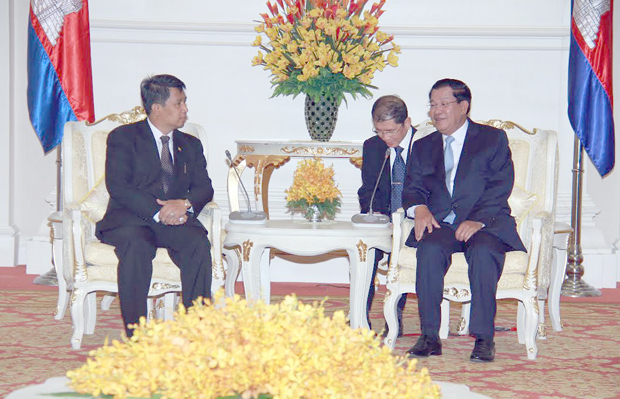 For his part, Samdech Techo Hun Sen lauded the good relationship and cooperation between the two countries, and spoke highly of the outgoing ambassador’s efforts in strengthening and expanding the cooperation between the two ASEAN nations.